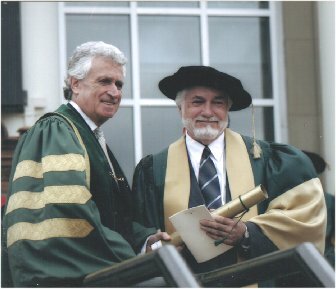 St. Thomas University, Fredericton awarded degrees to 497 students and granted honorary degrees to four distinguished Canadians  Wayne Curtis, Romeo Dallaire, Bernard Lord and Diane Lord  at its Convocation ceremony on May 9, 2005. Wayne Curtis is a writer, historian and conservationist whose literature celebrates the Miramichi and New Brunswick. He was born near Blackville and educated at St. Thomas University where he started writing prose. He has been writer-in-residence at Berton House in the Yukon and at the Institute of Superior Arts in Cuba. Curtis is the author of five books of fiction and four books of non-fiction. Many of these have been reprinted numerous times and his short stories have been anthologized or have appeared in literary journals. He has been a contributor to the National Post, The Globe and Mail, Quill and Quire, Outdoor Canada, Fly Fisherman, Atlantic Salmon Journal, Eastern Woods and Waters, and the New Brunswick Reader. He has won the David Adams Richards and George Woodcock awards, and is a member of the Atlantic Salmon Hall of Fame. The Renous River heads in central-northeastern New Brunswick with its two small tributaries, the North and South Branch. The North Branch, so famous in log driving folklore, is actually the outlet from North Renous Lake, a beautiful compound set in the forested hills on which Engelhart Industries had a lease and a lodge for many years. The South Branch heads up in the Guagus or Guagus Lake. These small rivers are different in character, but both are extremely turbulent with large boulders and ledges, and they become very rocky in mid-summer. I have fished the North Branch a few times and once caught a large trout on a dry fly at The Ledges or the Sawdust Pool, which is a deep hole in back of the old mill site (near the Highway #108 bridge). The South Branch is my favourite. This is a pretty little stream with steep eroding gravel banks, tall stands of jack pine, yellow-needled trails and sweeping pools. In the fall of the year my friend John Carnahan and I used to hunt birds along those shores and we always stopped and marvelled at the rivers beauty. At one time we discussed building a cabin there. After Johns untimely death, I thought of that river and my friend as kindred spirits. Where the two rivers come together at The Forks there is an excellent salmon pool, and further down, the Island Pool offers salmon holding water. Most of these pools can be accessed by pick-up truck if not a car, and are often vacant of anglers. Further downstream along the Renous/Plaster Rock Highway (a chip-seal 150-kilometre secondary highway across New Brunswick) there are popular pools in places like McGraw Brook (where there is a camp site) and the Matchett Pool, which can be accessed on foot from the highway. In the years that I guided for Black Rapids Lodge, which is on the main stem just up from Quarryville, we were instructed by outfitter George Curtis to take our guests to the Renous in two different conditions. One of these was when the water was really high in the main river. Depending on the rains, quite often the main river could be in peak flow, but on the Renous the water was normal because it comes from a different part of the province. Plus the Renous fished better in high water because of its smallness in comparison to the main stream. It was easier to wade, less dangerous, and the water could be covered with some degree of efficiency.